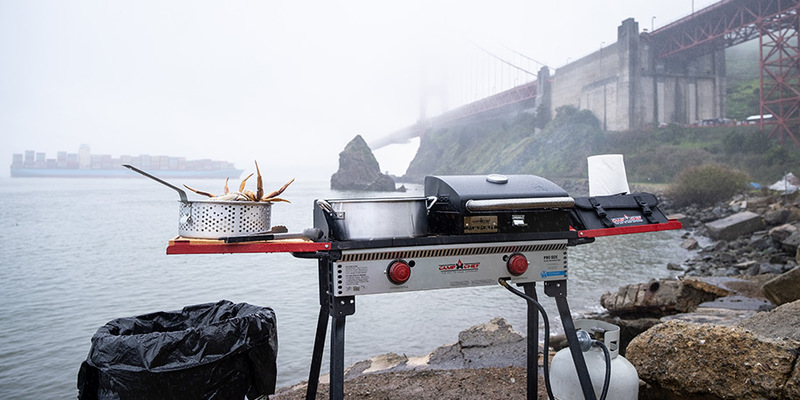 Recently Camp Chef’s in-house chef, Chef Jack and wife Julie Carlisle put upwards of 2,500 miles on the Camp Chef van traveling the California coast. We sent him on a mission to prove that Camp Chef products are durable, versatile, and portable. 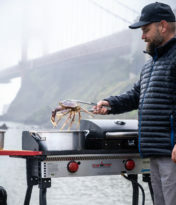 We followed him throughout the week as he cooked pizzas, stir fry, breakfast skillets, salmon, pancakes New York Strip, cheesecake, biscuits, chili, and this spontaneous seafood boil underneath the beautiful Golden Gate Bridge. But, beautiful as it may be, California in March presented a few challenges in and of itself. Between the pouring rain and the chilling west cost wind, it was anything but optimal cooking conditions. What better way to put our Pro60X two-burner stove system to the test? “I’ve never cooked a live crab before and it’s always been on my bucket list,” Chef Jack admitted. So, after consulting with a few local fishermen, Chef Jack and his team were steered to a nearby seafood peddler where he snagged a couple of freshly caught crabs. “Boil first, then finish them off on the grill,” the local fishmonger preached. Easy enough for us. 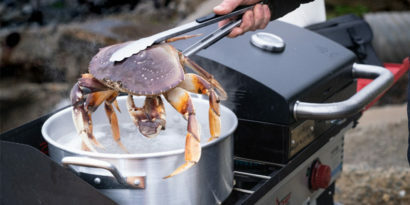 So, with two crabs in hand, Jack and his culinary team pulled out a Pro60X stove, our Deluxe BBQ Grill Box, Aluminum Pot Set, and our favorite Chef’s Utensil Set. Wind and rain now in full force, Chef Jack was able to get his stove and accessories set-up within minutes and water roaring in no time. Our results weren’t shocking but further confirmed that Camp Chef was truly built for all conditions. The Pro60X fired up and dutifully stayed lit throughout the relentless wind and rain. Despite the weather Chef Jack had a blast traveling, cooking, and listening to everyone’s Camp Chef story. Along the way, he encountered many Camp Chef lovers, but one celebrity in particular, gave us a real shock to the scope that the Camp Chef family has reached. “My business partner and I didn’t have a kitchen to work in,” our mystery fan told us. “So, we had our Camp Chef stoves and we would set them up and sit there and develop recipes.” We can’t spill the beans just yet but keep your eyes peeled next week for one big announcement. What kind of weather has your Camp Chef stove stood through? Any guesses to our mystery celebrity? Let us know in the comment section below! I love my camp chef.